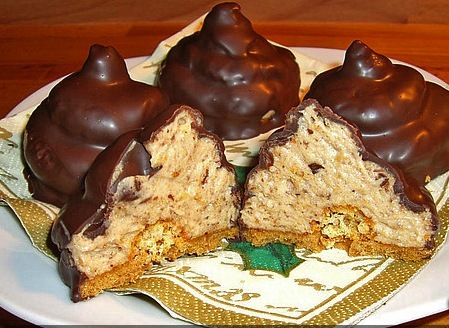 The German cake "Granatsplitter" or in English "Chocolate Mountain" is a typical German cake or sweet pastry that is made out of the left overs from cakes and tarts in the bakeries. The cake left overs are mixed with a buttery cream, cocoa, rum and almonds and folded on a bottom piece that is a cookie or wafer up to a height of 10cm or 4 inches. Then the little mountain will be covered with chocolate. Because the ingredients can vary the Granatsplitter is always different and this makes it so unusual. In Berlin they call them "Hackstockkratze", in the Eastern regions it is a "Punschberg" (because of the rum inside). For the glaze you can use dark or white chocolate. The recipe below is original and authentic German. Happy Baking! - Mix flour with baking powder, and sieve it on a baking board. - Make a mold into the flour, into this mold add sugar, vanilla sugar, rum and milk, mix with some flour. - Add cold butter that is cut in smaller pieces. - Knead until you get a smooth dough. - On a floured baking board or smooth surface roll the dough very thin. - Cut out round cookies (diameter 4-5 cm or 2 inches). Form some fantasy forms out of the remaining dough that you will need for the topping. - Bake cookies and fantasy forms for 10 minutes on 180 C or 350 F.
- Melt Coconut oil, let cool off a bit. - Mix powdered sugar with cocoa and vanilla sugar, add rum, then the egg and bit by bit the coconut oil. - Make crumbles out of the remaining fantasy forms, add crumbles and almonds to the the topping cream. - Place the topping like a little mountain on each cookie, let dry. - Make the glaze, then dip each Granatsplitter into the chocolate. - Let them dry and keep at a cool place. Oh, Gabriele wie fein, ich liebte diese Punschberge als Kind. Lecker!